We were very pleased with ourselves on a sunny day in July. There we were, making our own schedule and seeing the sites without paying for tours. I was very proud of us. But as we pulled into the train station in the city of Pompeii, we both asked: "how do we get to the the ruins?" We had no map of Pompeii - because we never thought we would have time to go. We got off the train and walked to a bunch of signs promoting tours. We were basically looking for a clue as to how near (or far) the ruins were. I asked a woman working at the information kiosk and she said old Pompeii was around the corner. And wouldn't you know it, two blocks from the train station were the ruins of Pompeii. Pompeii (in case you didn't know) was a city just like any other in 79AD. One day people were doing whatever Italians were doing in 79AD and the next they were buried alive in volcanic ash. Mount Vesuvius erupted for two days (see rendering), covering Pompeii & Herculaneum. In 1748, someone found it accidentally. 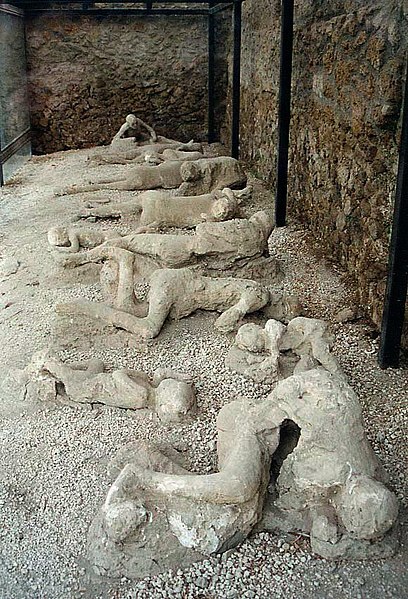 The excavation found people burned alive or suffocated or however one officially dies from volcanic ash. Step one: preserve. This is a picture of how people were found. They were casted in molds and moved to museums. I'm pretty sure none of this is still at Pompeii. There are just too many tourists and since the buildings are open for people to walk through them, the preservation would not have lasted this long. Now here are some pictures we took. There are a whole lot more in the photo album. The link is right off to your left. Knowing this history and actually being there was not as overwhelming as I thought it would be. Jesse kind of felt the same way. We suspect it was because of all the walking, and the fact that there are only tourists in Pompeii. When I turned a corner, I was briefly back in time, where water flowed through the streets and people jumped on giant rocks to cross intersections. Then someone with a camera would step out of a building, or a tour group would pass and the moment was lost. We were in a part of Italy that seemingly had no Italians. Eventually everything started looking the same, so we left. We were getting hungry. Some people take hunger better than others. Jesse does not take hunger well at all. He turns into a grumpy bear. So even though our next stop once back in Naples was to be at a restaurant, I felt it important to get Jesse something to eat as soon as possible. We stopped at a restaurant on the way to the train station and he got a pizza and a coke. He then ate the pizza and spilled the coke on himself. Then we were off. We never actually had our tickets scanned on the way back but whatever, we got home just fine. The ride from Pompeii to Naples is about a half hour, maybe more. It was a nice rest, then I started falling asleep. And then I wanted to stay seated and not walk at all. I was in for exactly the opposite of that.